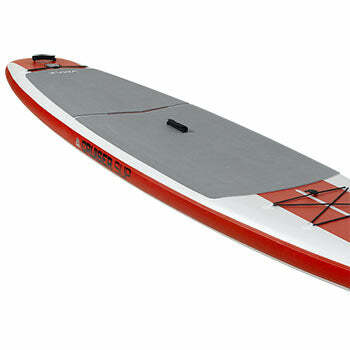 Our Best Selling Race/Touring board and lightest Inflatable SUP we offer at 23.5 pounds! Fast, stable, rigid and great tracking. 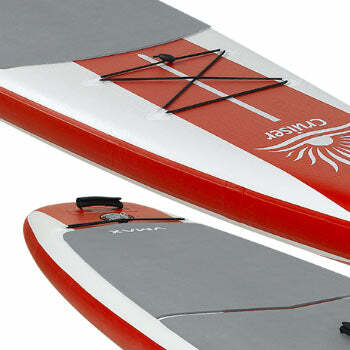 With 3 PC Paddle, Pump, Wheeled Back Pack, 3 Fins, Premium Deck Pad and Deck Bungees. Our Best Selling Race/Touring board! 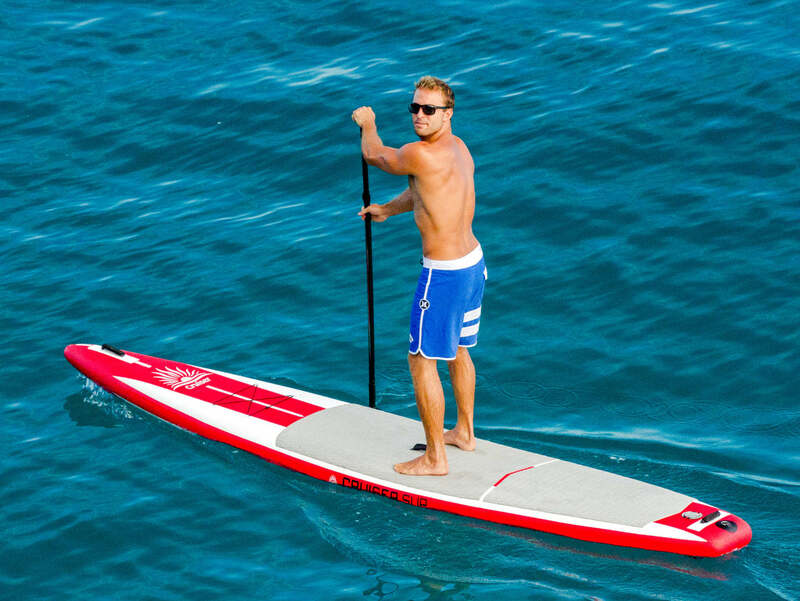 With excellent tracking and amazing stability the Cruiser SUP V-Max Lite-Air 12'6" is the fastest inflatable boards we offer. Cruiser SUP Research and Development has perfected the design to offer an inflatable 12'6" board that is ideal for touring, racing, fitness and anything in between. 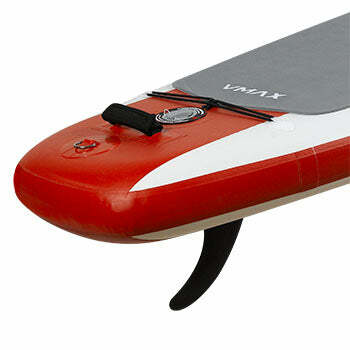 The V-Max 12'6" series are a staff favorite at Paddleboard Direct. Based on the wildly popular non-inflatable V-Max 12'6", the V-Max Lite-Air 12'6" is the lightest of the options. Ideal for riders up to 230lbs, the V-Max 12'6" series tracks like it is on rails, and our staff has yet to determine if there is any upper end to its speed. The V-Max Lite-Air 12'6" is built from the highest quality PVC Drop Stitch materials, and extra stiffness is added through a deck stringer. Includes with fin, pump, Premium deck pad, and 3 Piece Adjustable Alloy Paddle. Ideal for riders looking for the performance of a touring board, without the hassles of transport of a non-inflatable. The charts below show our recommended sizes based on weight, but there are other factors (balance, ability, experience, conditions, carrying kids or dogs and intended use) that determine a great fit. That’s why you’ll see some overlap in our recommendations. The best way to find your perfect fit is to consult the experts at Paddleboard Direct. 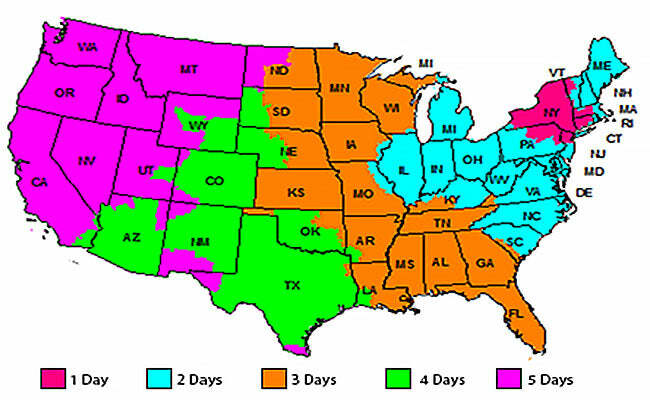 The Dura-Air construction features V-Drop Stitch Material, which is a durable PVC. On the inside, thousands of nylon threads connect the deck with the bottom of the board to keep it in a functional and performing shape. Utilizing the best drop-stitch material available on the market, this newly developed technology provides a perfect ratio of durability, weight and price. Built using specially produced, high density drop stitch that makes for a stronger and stiffer core. Take a look on the outside of a Cruiser SUP Dura-Air board and you will see thousands of dimples spread from nose to tail and rail to rail. Each dimple represents an internal thread. We do not use Linear drop stitch which is a mass produced, cheap material that cannot hold high pressure. Linear boards can be identified by the straight lines of dimples on the board. All our boards are made with the latest PVC Drop stitch fabrics. The fabric filaments between the two PVC layers surfaces are assembled to the PVC itself, by new Cruiser SUP Dura-Air Technology. Offering the best bond between the fabric filaments and the PVC surface layers; this secures a high stress durability over a long time frame. These special new Cruiser SUP Dura-Air fabrics are the only fabrics that have been tested to be able to withstand up to 43 psi inflation pressure and can be normally used with an average of 15 to 20 psi inflating pressure. Higher pressure means stiffer boards, that can hold their original shape at all times, thus preventing shape deformation, and thereby delivering better performance in all conditions. In addition to these special drop stitch fabrics, the boards are heat laminated with an extra Heavy Duty full layer PVC woven marine grade fabric on the deck and bottom, so that the Dura-AIr boards are both strong and durable, prevent the shape "twisting" and maintain the rocker line, as originally designed. High quality, plush EVA foam coverage for a soft, comfortable touch. With 4.5mm non-slip 'crocodile" texture EVA foam, it is extremely comfortable for cruising and yoga. Carry along anything you want from water bottle to PFD. 4 attachment points in front of the pad, and 2 on the tail allow you to take a long whatever you want. Comes with 9" Touring fin shaped for great tracking and glide. 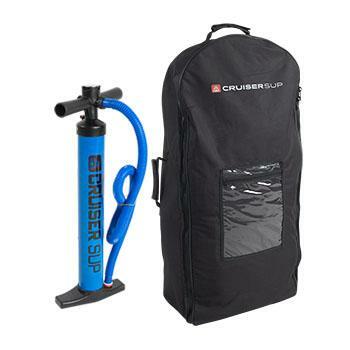 Easy transport and storage of your board, paddle and pump with the Cruiser SUP Wheeled Back pack. Dual action HD pump is a great way to inflate your board, with all up and down strokes forcing air into your board. Also use the pump to deflate for storage. I am extremely satisfied with this purchase. If you inflate close to max pressure 16-17 psi there is plenty of stiffness. I had no issue paddling for several hours on this board continuously. In some cases I did this with my two dogs. (I weigh 195, and each dog is 50 lbs). While the backpack is not something you would want to carry for long distances it holds all the associated gear (pump, paddle, repair kit) and makes this board easy to travel with. If you are a recreational paddler, the paddle that comes with this board does the trick, for my extended paddles with the two dogs, there were times I wish I had had a stiffer paddle, but the flex was only noticeable when I was really getting after it. My expectation is that for someone who wants solid performance out of a portable package, this set up will work for 98% of the population, as I felt as if I certainly pushed the boundaries of the entire set up. I knew before I tried paddleboarding that I would love it. My husband said I had to try paddleboarding before I bought a bored which is good advice but of course I knew I was already hooked so it was no suprise I loved it. I had be researching boards for awhile trying to find one that would work for me and my dogs German Shep and min poodles. I knew i needed a longer board so the CRUISER SUP V-MAX 12'6" seemed to be good. I wanted a racing board because after reading reviews people say they grow out of the all around boards fast and being boards are expensive I figured I would dive right and and get a narrower faster board. I have enjoyed the board a lot. No complaints with it the board itself. The pump it comes with does not work well. it seems to leak where the gage connects I tried to tighten but the gage just spins so it is as tight as it will go. I can barely, if I'm luck, get it to 10 psi. Once there is any pressure I have to pump my heart out to put more air in then what is leaking out. I am now looking for an electric pump but seems people have a hard time with them as well (connectors and overheating). So basically the board is great you can take it many places (I took it on a cruise to Mexico). We own a half-dozen Cruiser boards as part of our tour and rental business in coastal Maine. The V-Max Inflatable is our first experience with an inflatable board -- and it has met or exceeded all of our expectations. Once inflated, the V-Max Inflatable is very stiff and provides a solid, unyielding platform to stand on. We have noticed none of the problems that seem common to many other inflatable SUPs. Not quite as fast as the composite V-Max, but still speedy and efficient. I have really enjoyed the SUP. So far great purchase and Glenn was great with his recommendations and communications. The inflatable one is actually VERY stable! A couple of my friends purchased more expensive non-inflatable SUPs and I was surprised how much slower\less stable they were even though they were the same size the inflatable from Cruiser. Also one of them already has a crack in the hull in the first year! Inflatable so far so good!